Harley-Davidson has learned that the oil line clamp, part numbers 10198, 10080, and 10344, used on the oil cooling system on certain model year 2017 Touring model motorcycles (FLHX, FLHXS, FLTRX, FLTRXS, FLHTCU, FLHR, FLHRC, FLHRXS, FLHP, FLHTP) built in the U.S. July 2, 2016 through May 9, 2017, may not have been properly installed, such that an oil line may become detached and cause a sudden loss of engine oil. If this condition remains undetected, it could lead to oil on the rear tire which may result in loss of vehicle control, increasing the risk of a crash. Makes/Models: Certain 2017 Electric Glide Ultra Classic (FLHTCU), Police Electra Glide (FLHTP), Police Road King (FLHP), Road King (FLHR), Road King Special (FLHRXS), Street Glide (FLHX), Street Glide Special (FLHXS), Road Glide (FLTRX), and Road Glide Special (FLTRXS) motorcycles. 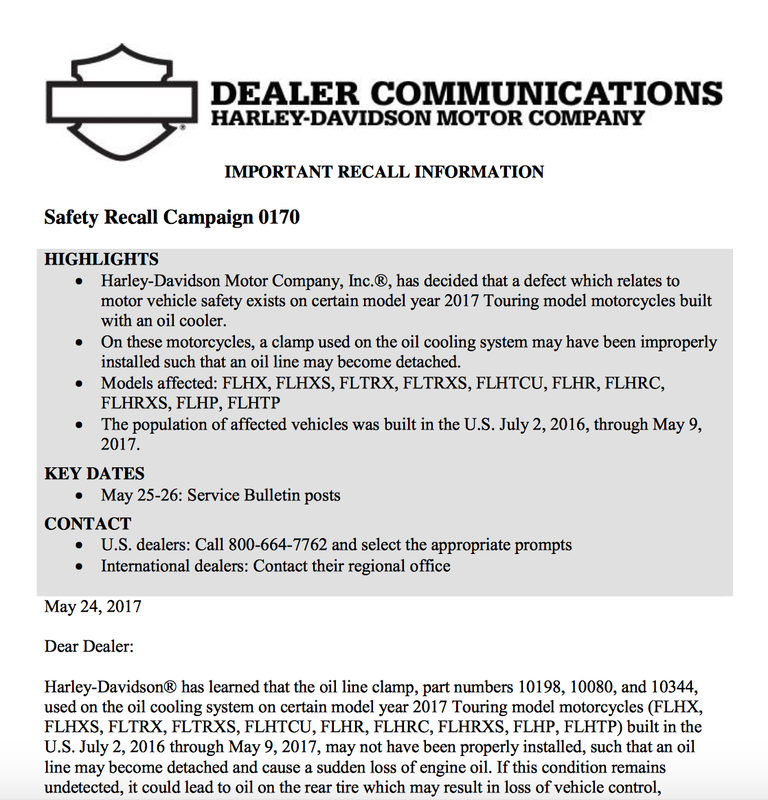 Remedy: Harley-Davidson will notify owners, and dealers will inspect and correct the oil cooler line clamps, as necessary, free of charge. The recall is expected to begin on June 6, 2017. Owners may contact Harley-Davidson customer service at 1-800-258-2464. Note: Dealers may sell but NOT DELIVER any motorcycles until the remedy is completed per the service bulletin. Owners may also contact the National Highway Traffic Safety Administration Vehicle Safety Hotline at 1-888-327-4236 (TTY 1-800-424-9153), or go to http://www.safercar.gov.